I am a very proud American who spends some of my rare free time on researching the true stories of the 200+ years of United States history. I have found the true stories are indeed stranger, and more exciting, than the fiction told throughout our nation's lifetime. For example, the poem, "Paul Revere's Ride", by Henry Wadsworth Longfellow (often incorrectly thought to be titled "The Midnight Ride of Paul Revere") is taught to children based on how the poem was written. The true story is told best by visiting the Paul Revere House at 19 North Square, Boston MA 02113 or by visiting the website: Paul Revere House. I encourage everyone to learn or re-learn our nation's history as it really happened. The true stories are much more exciting and informative! Knowing the truth can change the false perspectives too many people believe - knowing the true history can help us all avoid repeating the tragedies and horrors of the past. 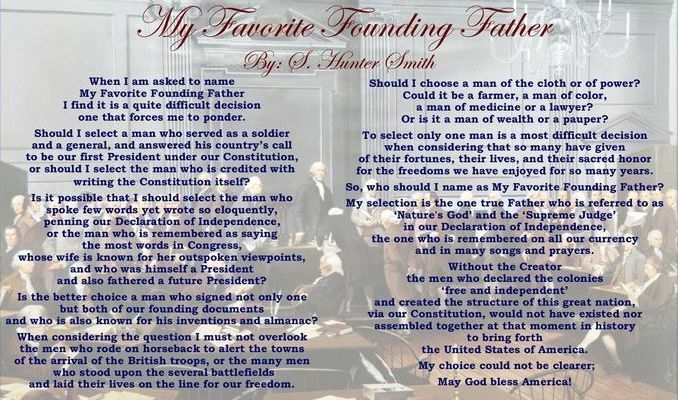 What made me write "My Favorite Founding Father"? In the summer of 2010 I was running for a seat as a Delegate in Maryland's legislative district 11. During one of my public appearances, after mentioning my interest in American history, a person shouted, "If you love history so much, who would you say is your favorite founding father?" With little hesitation, I replied with an abbreviated version of what has become the "My Favorite Founding Father" poster you see above. My reply that day was not rehearsed - it came instantly and straight from my heart, as did the words I wrote later that same day. My devotion to the answer I describe is clear and I will forever stand by my choice.